In the early twentieth century in the dry dusty south western corner of Africa, the attention of two of the great colonial powers of the world in the early days of the First World War – Britain and Germany, was focused. For the British they had only just recently concluded the Second Anglo-Boer War whereby the new South African Union was born. Germany had acquired South West Africa less than a decade before in the Herero War that left the countryside traumatised and German coffers much reduced. This enmity of their occupation ensured that no Askari forces would be available as was successfully done in East Africa to supplement the much reduced German forces needed to protect the costly acquisition that was German SouthWest Africa (GSWA). On the outbreak of the First World War the need to eliminate the use of the German protectorate as a base for its naval forces and world wide wireless communication point was paramount. The South African Union prime minister and general, Louis Botha, put forth a proposal to allow the South African Union forces to take the lion share of the burden in ejecting the Germans from Southern Africa. 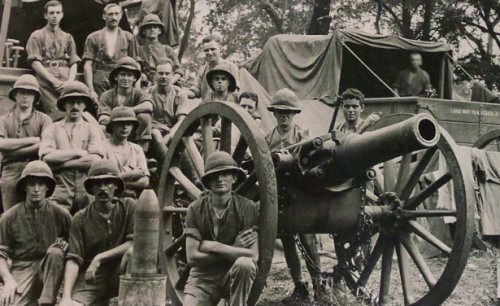 Conveniently the British government assented so as to limit the need for overseas troop deployments away from the pressing needs of the Western Front in Europe and for Botha he saw the benefit of acquiring this region to the betterment of South Africa. The campaign is well detailed in a number of online sources, not least of which is the Strategy and Tactics article accompanying the game; suffice to say that the South African led forces had an abortive start in late 1914 in the south with their rebuff at Sandfontein and putting down of ‘Maritz’s rebellion’ before remounting a more comprehensive and overwhelming attack early in the following year from their sea side bases at Walvis Bay and German held Luderitz Bay. As the map shows the subsequent campaign involved a multi pronged attack over inhospitable terrain, largely driven by the limitations of water and supply for man and beast. These were essential and principal elements of the campaign. Despite a number of spirited defensive actions the German forces were forced to surrender within 6 months of the second invasion in 1915. Whilst the outcome was likely given the forces available to the (Allied) British and South African Union army the campaign incorporates many interesting elements, particularly worthy of a strategic wargame. It was a highly mobile campaign with multiple axis of advance, interior German lines, significant logistics problems for the larger Allied forces and a kaleidoscope of force types including traditional infantry forces supported by mounted infantry, artillery, naval forces, armoured cars and trains, planes and a host of other colonial style troops. Some interesting ‘what ifs’ are also proposed by the S&T game involving additional German marines and the possibility of East Asian Squadron forces playing a role as well. The very nature of the force combination and axis of advance variation can allow for a fluid situation. Initial after action reports indicate the game gives a nice close contest. For those interested in this campaign a very readable companion to the game that I highly recommend is the following book, The Horns of The Beast, by James Stejskal. As I like to use wargame campaign studies as interactive history lesson tools I’ll offer some observations and thoughts on the game as history at the end. Strategy and Tactics Game – #313. The Strategy and Tactics game incorporates many aspects of the GSWA campaign. The game system is ‘clean’ and incorporates all the features of the struggle in an approachable 16 page rulebook. 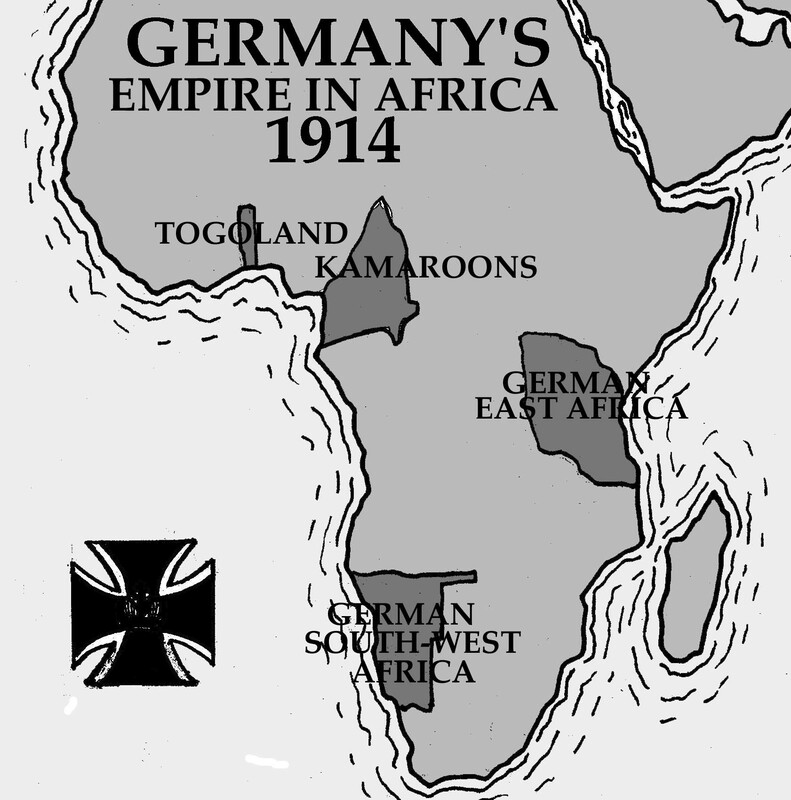 The 1914-1915 campaign in Southwest Africa is a unique asymmetrical situation, with a small German colonial force defending a vast colony against a much larger Allied army. Both sides were highly mobile, teaching lessons of value for many of today’s small and not-so-small wars. The central system for Windhoek models command control, quantified as Action Points (AP). Players accrue AP based on leaders on the map, control of mining towns, and friendly wireless stations. They are expended to conduct maneuvers, recruit forces, and provide logistical capabilities. The game is a war of columns. You form up a force, move cross country, hit hard (or not! ), then exploit or fall back. Your columns can sweep across the map, but so can the other guy. In bush warfare, mobility can be more important than firepower. A wide range of units is available for each player: mounted troops, armored cars, aircraft, camel corps, Boer commandos, armored trains, and footslogging infantry. The British had a larger empire from which to recruit, making available high powered units such as the Rhodesia Regiment. There is also the possibility of the Portuguese colonial army marching in from Angola. The Germans have some optional forces such as colonial marines on the assumption that the home office had reinforced the colony prior to the outbreak of the war. Windhoek’s combat system is quasi-tactical. Tactical superiority is determined first, giving the superior force the first fire. Quality of units counts as much or more than raw strength: leaders and aeroplanes, for example, contribute to tactical superiority. The superior force can also declare a withdrawal, meaning an outgunned force can head for the hills instead of making a glorious last stand. Both sides have plenty of opportunity to attack and defend. The Germans can raid into Cape Colony and or go into Portuguese Angola if the latter enters the war. Even when the 11 Germans are forced back by enemy drives, they can exploit wide open spaces to raid the Allied rear, cutting rail lines and harrying garrisons. The Germans may be outgunned, but they have the advantage of falling back on their own depots, while the Southwest Africa railroads facilitate the movement of men and materiel. The Allies have to fight a war of logistics, building railroads and moving supply forward. Fighting for control of critical water sources becomes a major operational goal. The Allies can win if they take their time, but they have only ten turns so they must move boldly. The Germans cannot sit tight—they have to get active if they want to take the colonial capital at Windhoek. Raids and sharp counterattacks can turn the tide, and small forces can take decisive actions through skill and a little luck. It all this makes for fast and furious action on the far-flung frontiers of the British and German empires”. For my playthrough I want to look at the defensive potential and strategies of the German forces against a larger invading enemy force. 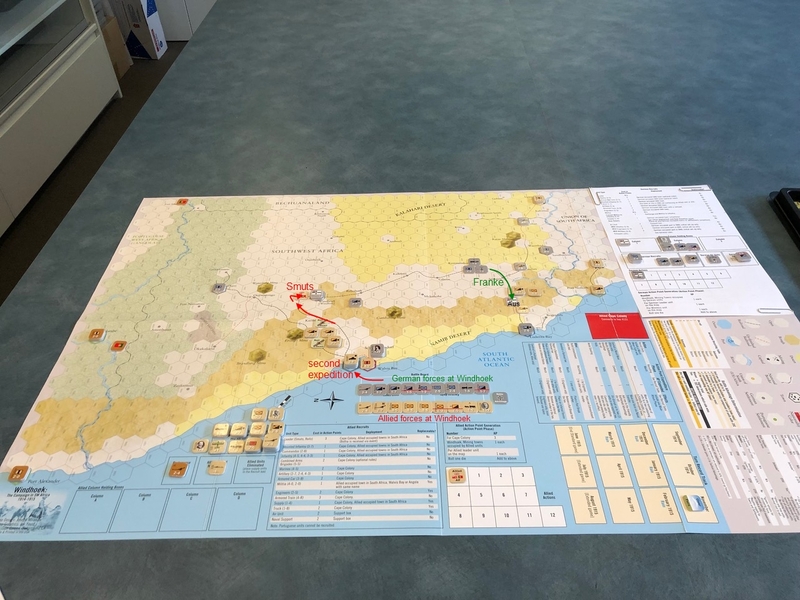 The game uses a fog-of-war system, enabling the Germans to see the Allied forces in GSWA so this will not impact too much on the game from issues relating to hidden movement as the designer intended when solo playing the German side. The game commences in September 1914 meaning it incorporates the initial operations that resulted in the Sandfontein and Maritz rebellion affairs. Though possible, its not likely such outcomes will necessarily occur in the game. This provides for many potential start strategies that can deviate from those historically taken. The continued ‘second invasion’ really didn’t get going until March 1915 (turn 7), several months after the first landings, so the war progressed quite slowly in relation to the time frame of the game – which has the game end in June 1915 (turn 10) – I suspect the Allied forces will need to be more aggressive than Botha was to deny the German’s their ‘morale victory’ which requires the Allied forces to occupy all towns to claim victory, else the Germans win…but we will see. In our game the full range of strategic operations will be available to the Allied ‘player’ from the outset which might change things up considerably if the Sandfontein ambush does not occur and other events do. The event table uses a 2d6 die roll meaning the events likely will differ from those of history particularly when combined with the fluctuation of the action points method used to drive all critical game mechanics. I have randomised the initial placement of Allied forces, having initially set up the Germans as per the rules, and then will make Allied invasion plans based on those dispositions. Setting the game up, I placed the German forces on map as per the standard set up. Some latitude is allowed in where troops are placed. As I shall be ostensibly ‘playing’ the German side in this solo playthrough I deployed the German forces not knowing where the Allied forces would be placed. The Allied deployments were determined randomly (on a d6) with a greater emphasis on deploying units in the Cape Colony Box (4-6), with other deployments in Upington (1), Springbok (2) or Port Nolloth (3) respectively. The Angolan deployment was similarly done with troops placed in their obvious and assigned positions as per the set up. The resultant dispositions were as follows. The initial setup for the Germans aims to cover the full gamut of potential Allied invasion plans. Historically the Allies attacked overland from the South and then from the sea at Walvis Bay and Luderitz Bay. The German dispositions garrison these locations quite heavily but have most forces placed on the rail hubs of Windhoek and Keetmanshoop to enable rapid movement north and south. The South African border is covered with entrenched lighter forces, used most likely in a delaying role until the Allied force concentration declares its hand. To be successful the Germans cannot hope to just outfight the Allied forces. They are going to have to rely on the full spectrum of what will virtually be asymmetric warfare with the occasional set piece action. They’ll need to use mobility to cut enemy lines of supply whether they be road or rail, entrench to delay or hold, utilise the ability to withdraw where possible, concentrate on force leaders, resort to infernal devices and most importantly keep their action points high to give them strategic mobility and choice. That said, the Germans don’t have alot of strategic depth and must use the aforementioned stratagems to prepare for favourable defensive set piece actions in the hope to delay long enough to achieve victory. Allied plans will for our game develop from the force locations derived by deployment as described above. This randomness creates an imperfect but also variable component to the (solo play) allied plans which may in some way replicate the ‘false start’ of the allies in late 1914. Whichever way the in game random events play out will also affect how the campaign unfolds. The above mentioned German tactics will essentially be the reverse for the Allies. They will attack in force, use flanking movement and secure their supply lines attempting to overwhelm their opposition. Whilst the Allies are very large they need supply and this will be a potential achilles heal though they do have access to mobile supply sources. This should realistically give them a chance of steamrollering the Germans and achieve a victory, though time is precious. Whilst plentiful, the onus of victory is on them – they must conquer or die! Though ‘playing’ the German side I find solo play usually has me, variously barracking for one side or the other as their fortunes wax and wane…meaning I tried to play to the best of each side’s opportunities as they are presented which hopefully the narrative shows. The enjoyment and interest is in seeing the history unfold and the potential ‘what ifs’ that could’ve occurred. 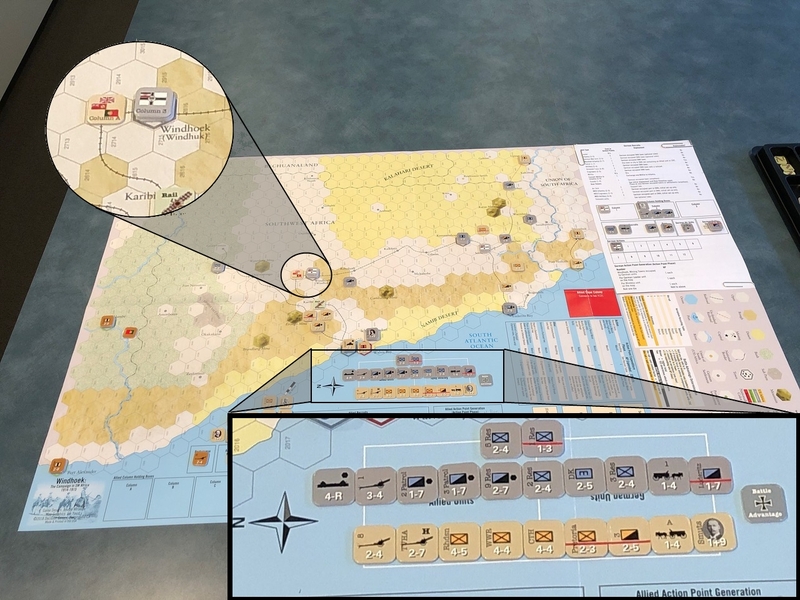 Things change constantly in this game system with the variability of the tactical system and action points assignment, making it particularly suited to solo play. The game opened up with the Germans in Windhoek and Keetmanshoop. The coast was garrisoned at Swakopmund (next to Walvis Bay) and Luderitz Bay. Several ‘trip wire’ units held outer posts near the South African Union border…all as per the setup. The Allies used their initial APs to build up their force in the Cape Colony and then proceeded to invade at Walvis Bay with a substantial force. They also built up forces in the border region in preparation for an overland attack…very much the historical plan which their initial deployment made viable. In October 1914 (turn 2) the Angolans threw in their lot with the Allies. 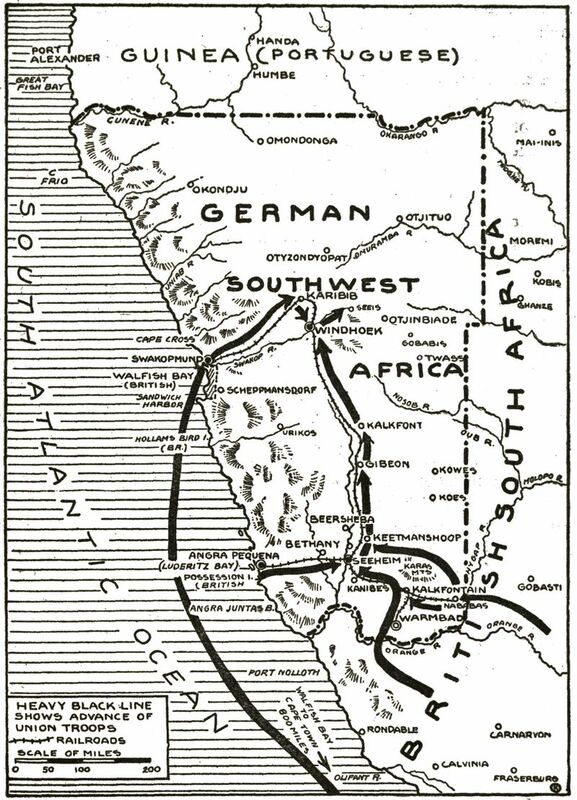 Smuts with his force landed at Walvis bay precipitating a German withdrawal up the Swakop Valley, abandoning Swakopmund, setting up a defensive line in the hills abreast of the Erongo Mountains, destroying rail lines as they went. Von Heydebreck, the German commander, pushed up a force from Windhoek to bolster this defensive line. He sent a mobile force of cavalry into the hills to the south of the Windhoek approaches and slowly added force to Franke’s command in the south. Activity in the south however remained fairly limited due to a lack of action points by both sides after the manoeuvring in the north. Smuts engaged in a brisk action in the hills of the Swakop Valley with the German force being easily defeated. A lesson learned for Von Heydebreck as he did not prepare his position with entrenchments – to be fair, the British got the jump on him before he could do so. He did have the good sense sense though to withdraw his main force back to Windhoek and consider his next move. Subsequent turn events triggered more Angolan reinforcements, no doubt Lisbon sensing an easy Allied victory. With the German’s falling back Smuts’ force was well in command of the Swakop Valley approaches and so early in the campaign too. The rains would come in a few months, though threatening (by event roll) but for now in late 1914 things looked promising. 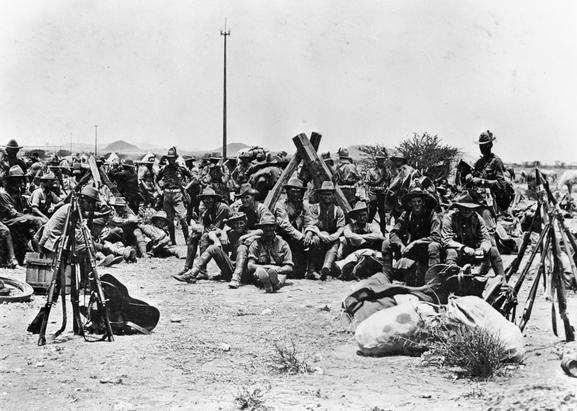 …Allied troops take a well earned rest after the Battle of Swakop Valley. Heydebreck’s strategy now needed to shift. It was late 1914, the rains would come slowing down operations and might have enough time to rebuild. He commenced recruiting immediately mustering his forces in Windhoek as he aimed to make a stand and not easily give up this key location, saddled as it was on the rail line to Keetmanshoop in the south along with its important wireless station. For Smuts, it was steady as she goes. He counted on building forces in the Cape for a second landing expedition to land in December as well as building a strong force in Port Nolloth to the south. Smuts strategy was going to rely on coastal lines of supply and force concentration with a move inland from there. He had three main columns and looked to strike his enemy from multiple directions if he could coordinate it and had enough resources (ie action points). By December the rains had come. In the south South African forces had moved out of Port Nolloth and proceeded overland, negotiating the Orange River and moving on Aus. The German commander Franke, in Keetmanshoop, responded with a punitive expedition down the Keetmanshoop-Luderitz Bay road. 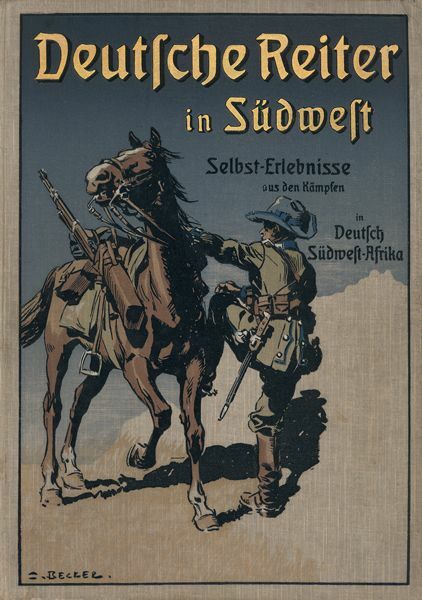 Some brisk skirmishing took place between both side’s mounted forces and a draw resulted with the South Africans poised for an opportunistic strike at Keetmanshoop should they choose to. Smuts now saw an opportunity to strike both at Windhoek and Keetmanshoop and break the back of the German resistance by Christmas. Though rebuffed at the battle in the Swakop Valley in the previous month Heydebreck sent a mobile column of mounted infantry, camel corps included, toward Walvis Bay to threaten the British lines of communication even though Smuts had horse drawn supplies with his column. This all mounted force was holed up in Scheppmansdorf, courtesy of the local farmers. Fortune may favour the brave but failure is its ugly cousin. So it was at the battle of Keetmanshoop. The South African coup de main failed to make an impression after the Allies lost the battle initiative twice and the remnant force, a unit of engineers, retreated into oblivion into the Kalahari desert. Franke, emboldened, launched his own attack down toward Luderitz Bay and fought an inconclusive though active defensive action near Aus. For now, the Germans had seen off the threat in the south which would take the Allies a couple of months to recover from. Meanwhile, in the north the Allies landed a second expeditionary force in preparations for the consolidation of Windhoek and importantly a drive on the northern town of Otavi. Included in their force were some British RNAS Rolls-Royce armoured cars – these would add alot of maneuverability and quite some punch in combat. Smuts’ main column continued its advance and approached Windhoek from the northern along the rail line in preparation for an assault. So, whilst the setback in the south was irritating the main thrust as Smuts had planned would come from the northern pincers, both now in place. Up to this point the Angolans were not requested/required to participate and held their own colonial possessions intact. The stage was set for phase two of the advance on Otavi and attack on Windhoek, with Smuts declining to further bolster his force with more reinforcements from the Cape, deeming his force in hand sufficient for the task. Preparations made, in later November Smuts launched an attack on what he deemed a fairly weakly held Windhoek hoping to overrun the town and smash open the German defense, perhaps even sweep them from the north altogether. His attack however faltered as he had few APS to press the attack though it did considerably weaken the German defenders, though not enough to evict them from their stronghold. Thus a quasi-siege set in with both commanders wondering what would the new year bring? On New Year’s Eve Smuts moved his force off from the direct approaches to Windhoek as intelligence reported that the Germans had made operational their armoured train. Then, in the early hours of the 1st of January Smuts launched his attack from the north-west over open ground with considerable forces in hand, hoping to catch the Germans off guard. Though he knew the German defence had been bolstered by some reinforcements and the town was now ringed with dug in infantry, he still considered attacking before the Germans could be further reinforced any further. With that and a full 12 action points in hand, Smuts felt confident he could smash the German defense of Windhoek. He expended some APs on minor movements in the south and then launched his attack. Despite his preparations the Germans gained the first battle advantage and made the Allies pay. However Smuts had a fresh brigade of infantry, with weakened elements of the Pretorian infantry regiment, and many supporting elements so would be able to absorb much punishment. The attack, though spirited, failed to make a serious impression particularly with the Germans winning the battle advantage, but he nevertheless did chip away at the defenders, hoping his still powerful forces would be sufficient. The Battle of Windhoek, Day 1, 1 Jan, 1915. The second day (round) of battle saw the Allies with the tactical advantage but in what can only be described as a completely botched assault, failed to make any impression on the Germans at all (all three infantry battalions , needing 4 or less to hit – missed!) – a decisive outcome that still left him with much combat power but he had failed to weaken the German defenders as hoped. So it was, Smuts rolled back down the Swakop Valley and into the relative safety of the hills falling back on his mounted infantry forces around the Erongo Mountains – the Germans hold! Hearing the news, Von Heydebreck, who was with his mounted infantry in Scheppmansdorf, was ecstatic. Immediately springing to action he led a mounted attack against the Allied cavalry in the Erongo hills and hit them hard, taking out an isolated company of burghers. Still not satisfied, he continued (using another AP) a mounted sweep by attacking the two sister companies of South African horse unit. The Germans, the sniff of victory in their nostrils, drove home the attack and swept all before them winning the battle initiative in each combat and defeating the Allied horse before they could fire back!…three enemy cavalry companies scattered! March 1815 (turn 7) and the British position looks hopeless. Whilst still ‘viable’ the need to rebuild forces will mean the clock will run out of Smuts’ campaign. By March Smuts was still in camp in the Erongo mountain foothills whilst Von Heydebreck had consolidated and entrenched his forces. He was still attached to his mobile strike force of mounted troops with Windhoek strongly held and Keetmanshoop building further. All the main lines of advance for South African success were well defended and it would now take some time to reinforce and build a sufficient force to make any impression from the south, or a re-invasion of the north. While still strong forces were available in South Africa, the expected campaign end of May 1915 was fast approaching with success looking improbable. This game is quite engaging and a lot of fun. As the blurb says, there is alot going on and pretty much all the pieces of both modern and colonial warfare are mixed into this one campaign title. The game system is easy to play and I did not have questions that weren’t covered during this playthrough – though off course I haven’t dissected the game to the nth degree. Some questions have popped up on the consim folder but no more than any other – so it’s all good. What the game demonstrated was that insufficient force, in this case Smuts’ column in front of Windhoek, advanced too quickly and pushed to hard for a decisive result to early. Once committed perhaps he was left with little choice. The Day 2 assaults were particularly bad in that they made no impression but the hasty advance and assault relied too much on favourable and not overwhelming combat outcomes. 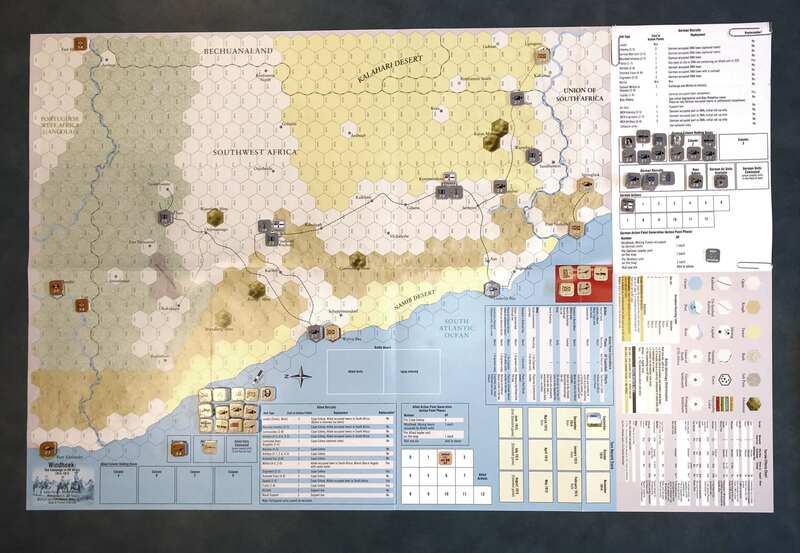 In the real campaign Botha had an operational pause after his Swakop Valley battles and the Allies in this game would have been well advised to do the same. They could have waited another two months (turns) and brought up significant reinforcements which would’ve given them sufficient force to outfight and outmaneuver the German defenders. A lesson taught and reaffirmed by the historical record! The campaign itself has alot of appeal and is not covered in any other game format as far as I know – possibly the hallmark of many Miranda game titles. He takes a sometimes obscure topic and provides the essence of the contest with many chrome events added for immersion. It all works in Windhoek. There is the potential for alot of manoeuvre and the action points system works well. I like the way it allows players to put their resources into specific schwerpunkts and allow multiple operations by those forces. It’s a constant struggle to decide whether to build forces, where to move and attack and how many action points are needed kept in hand to keep pressing attacks…it’s quite thematic. This, the first game, was as much a learning experience to see how the ‘parts’ fitted together and to get across the system a bit. I do like the quasi-tactical aspect of the game that really jazz up the combat a bit. The action point system allowing multiple activations which opens up many potential player options as well and has a nice in game resource allocation element to it. I hope Joe expands on using this system for other games and I am keenly anticipating his 1911-12 Italian-Ottoman War in Libya game using this same system, which has had no game treatment AFAIK. The withdrawal system used in this game would work well for WW1 East Africa – though that game space is pretty full with many titles on that topic. Looking at the forces involved it seems to me that the forces available to the Germans are optimised – the higher numbers given by Collyer’s account (7000 men) would seem to reflect the German order of battle. By that I mean you do have a fair bit of combat power where historically their resources were limited, but whilst numerous the German forces are somewhat weak. I would say from my take that the game presents the best the Germans could have hoped to put in the field and the design reflects that to make the game at least closer than were the historical events portrayed or close to them. It’s also a case of the Germans know they can’t win an attritional contest and the victory conditions challenge the Allied player to do as well or better than Botha did historically. Franke considered a guerrilla war option but the terrain was far to inhospitable to contemplate it in the longer term. The arbitrary end date for the game is a tip to the idea that the German player cannot truly win with such forces arrayed against him if the Allies ‘do it right’ as Louis Botha did. The inevitability of the outcome however would seem to be obvious given the size and resource differential between the adversaries. Was it just shear force or Botha operational art that led to his victory, or both? This game can explore some of these ideas, perhaps more so if the historical set up conditions were replicated a bit more closely. Conversely those same principals applied by an active German defense against a correspondingly unimaginative Allied campaign stragegy could produce interesting results counter to the historical record. For those interested, a very interesting discussion on these very points can be found here. To really dig your teeth into this stuff the same chap did his PhD dissertation only a matter of weeks ago on this very subject….great reading…grab it! The game as history, or more correctly, to be structured as per the history of the real campaign, would IMHO need to be given a few tweaks if one wanted to replicate the actual campaign something along historical lines. The game events would have to be put in their respective historical timeline and one could play it that way and then move around those fixed events. The game is not designed to do this, which is perfectly valid, as the current event table provides a range of outcomes that could impact at varying times…this is all reasonable in the scheme of looking at the military possibilities. Maritz’s Boer revolt occurs on turn 2 – use event table set up. Allied Leader Smuts is pre assigned to the Cape Colony command at game start. German Von Heydebreck’s death occurs on turn 3 – remove from play in the German Recruit Phase. The rail line from Swakopmund to Windhoek is unusable by the allies (but is by the Germans) – the allies must build a new rail line as per the rules for rail construction, however it does count as a road for all purposes as per the rules. +1 AP to the Allies from turn 3 onwards – reflecting the high number of independent commands led by General Mackenzie, Colonel Berrange and Colonel Deventer. Botha may be placed with any command on turn 6 – he adds +2drm to all subsequent action point die rolls. EVENT – Rehoboth Baster uprising – from turn 6 this becomes the (die roll 8) in game event. If rolled for, reduce the German APs by -1 this turn. There is also the possibility of assigning historical deployments for both sides as well, which further makes the game reflect the historical start situation. I’m awaiting the delivery of Collyer’s offical history to look into this so when I get that I’ll look to seeing if an historical scenario set up is doable and update this post. Victory Conditions – ignore the current victory conditions, including German sudden death victory conditions. The British win if they occupy Otavi, Windhoek, Keetmanshoop and Luderitz bay – they may ignore any other towns. If they fail to occupy all these towns by the end of turn 10 the Germans win. Such modifications should not be taken as a negative on the game as it stands – on the contrary, it shows what else can be done with the game and further makes use of it as a tool to study the campaign within the limitations of the game system. These approachable and tweakable games add good replay value by using the same game in a number of different ways and really add value when historical research intersects with clever game design to produce an interactive window into historical outcomes and potential counterfactuals.